Ideal for automotive, outdoor, entertainment, retail, and decorative lighting applications, the Multi-String LED Lighting design implements independent multi-string LED lighting with high resolution dimming. 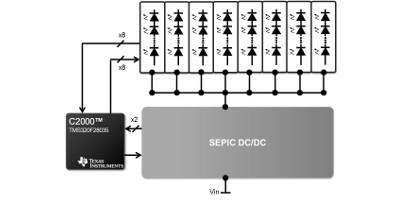 The LED driver consists of a microcontroller-controlled DC/DC Sepic Power stage and eight independently dimmable LED strings complete with overcurrent and overvoltage protection. 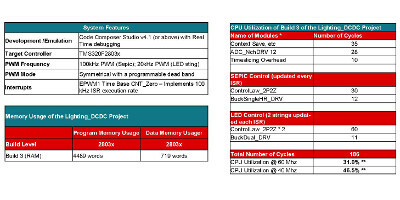 • Precise LED dimming control and efficient power stage control made possible by the C2000™ Piccolo™ TMS320F28035 microcontroller. • LED lighting reference platform is available for purchase and includes hardware platform, software examples and libraries, graphical user interface (GUI), technical application notes, and step-by-step theory-based user guides. 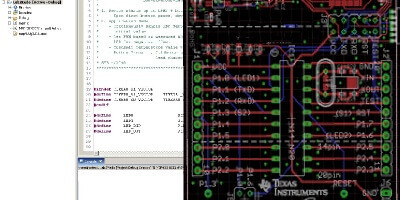 NOTE: Software for this board is located inside the controlSUITE™ software package. Download controlSUITE at http://www.ti.com/tool/controlsuite. Once installed, navigate to "DC/DC LED Developer’s Kit" under the Development Tools -> Lighting section.